The Orwellian “Truth Team” which has been panned even by the mainstream media – Jake Tapper busted them on Saturday, for example – is not about the truth. It’s about spin. Sometimes “spin” can be a lie. Like this time. Back in September, as part of the American Jobs Act, the President called for providing a $4,000 tax credit for businesses that hire the long-term unemployed–a similar approach to what Romney suggested Thursday night. Yet Republicans in Congress blocked this tax credit, along with the broader package the President put forward to help workers get back on the job, at every turn. There are two main lies in this paragraph. The first is the lie that Republicans blocked the tax credit. Not true. Mitch McConnell offered the entire American Jobs Act as an amendment in the Senate and Harry Reid blocked it. Last time I checked, Harry Reid is a Democrat, not a Republican. So the overall bill, which Reid had poisoned by putting a “millionaire surtax” on it to pay for it, was dead. In taking this tack, Reid risks further inflaming partisan tensions in the Senate and alienating some moderate Democrats who have kept their distance from the president’s jobs plans. The American Jobs Act — which would have been paid for by a 5.6 percent surtax on millionaires — fell nine votes shy last week of breaking a GOP-led filibuster in the Senate, after two Democrats joined a united Republican Conference in blocking a debate on the measure. Oh wait! Maybe the Truth Team was right! Wrong. Republicans objected to Reid’s method of paying for it. Oh, so did Democrats. However, less than a majority of the Senate supports the overall bill, since at least five Democrats said they would oppose the measure on a straight up-or-down vote. Obama offered to break up the American Jobs Act into smaller pieces that could pass. Some parts failed, other parts passed. The specific section that the “Truth Team” says was blocked by Republicans at “every turn” was introduced by Senator Blumenthal (D-CT) and referred to committee. It’s still there. I’ll remind the “Truth Team” that Democrats control the committees in the Senate, not Republicans. Therein lies the second lie. It’s impossible for Republicans to block something at “every turn” when Democrats haven’t even let it out of committee. 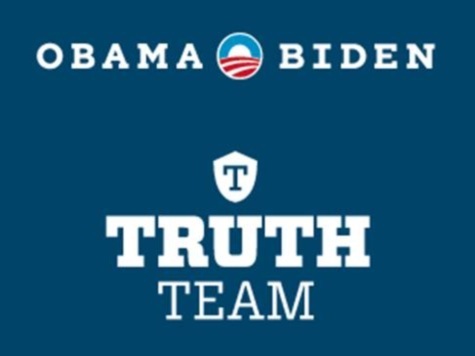 The Truth Team is a fraud.